The roots of ATMs go to the efforts of banks to reduce the operational cost at branches. Back then, to provide services to the consumer at the most convenient and nearest locations, the banks needed to setup branches at the deepest part of the country. Creating a new branch had its own cost – space, people, electricity, maintenance and many more. However, most of the transactions that took place in the branch were cash out and checking of balance. Came in the ATMs and changed the entire ball game. Banks started setting up ATMs aggressively. Companies like FIS, IndiCash, Clover, started providing ATM setup and management as a services. The world was good. That phase of cost savings has gone and the bank managements have started looking at ATMs as a strategic location to generate revenue from. 1. 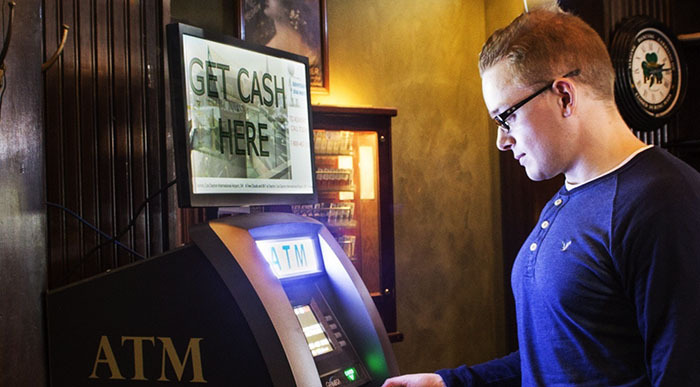 Can my ATMs, instead of being a cost, generate revenue? 2. Can I communicate effectively with the visitor at ATM? 3. Can I generate new leads at ATMs for my new offerings? How digital signage help in generating revenue at ATM? A prominent digital signage placed inside an ATM will gather the attention of visitors. These visitors are from nearby locality and have ability to spend. The profiles of these people is attractive to nearby merchants and they would like to present their offering to visitor while he is waiting for transaction is taking place. However, in some of the countries the regulations may restrict external advertisements inside the ATM. Advertisements of the owning Bank are allowed. In India, there are White branded ATMs and Brown branded ATMs. Brown branded ATMs are the property of the banks, whereas White branded ATMs are the property of the maintaining companies like Clover, FSS etc. Similar to nearby merchant’s national brands too are keen to get undivided attention of users at a captive location. The research suggests that, in India the audience who typically visit ATM regularly is male, middle edge, earning person. Brands want to promote their products to this profile. Banks can play a video of its new offering and inform consumer about the new facility. A touch signage can encourage visitors to leave their mobile numbers with signage and request for a call back to get more information about the offering. The signage can keep repeatedly informing visitors about the importance of PIN security, OTP usage etc. Installation of context detection signage are smart devices that understand the presence of visitor in the location and play a specific audio clip not only attracts the visitor’s attention but also provide important information to the visitor e.g. on door open the signage plays “Welcome to our ATM, we are delighted to inform you that bank has started offering home loans at lowest interest rate. For more information, leave your number of the signage installed in ATM.” at the same time the loan promotion video plays on the signage. In ATM it is very important to understand the security aspect of the solutions. Generally, in many of the ATMs in India, the cost of maintenance is high enough that the security person is not appointed. The ATM machines are so sturdy that they are difficult to cut or pick from the location. However, same does not really apply to signage. Signage needs to be fixed in such a manner that it will be very difficult to remove. It’s a fine job with skills, that ensure the aesthetics of the signage at the same time provide enough security to the equipment.